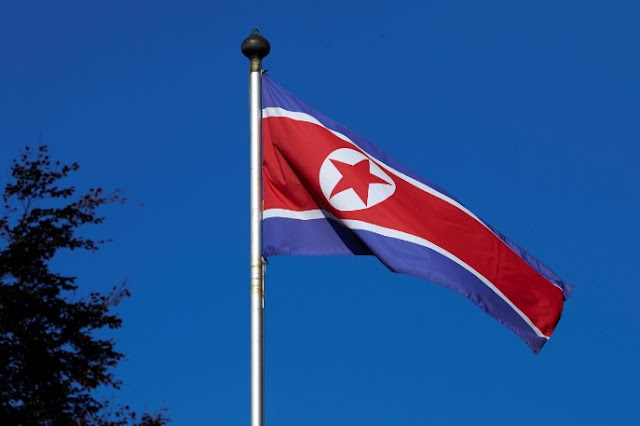 A North Korean flag flies on a mast at the Permanent Mission of North Korea in Geneva October 2, 2014. BEIJING/SEOUL - China said a magnitude 3.4 earthquake detected in North Korea on Saturday was a “suspected explosion”, raising fears the isolated state had conducted another nuclear bomb test just weeks after its last one. An official at South Korea’s meteorological agency said they were analyzing the tremor, which they put at magnitude 3.0, but the initial view was that it was a natural quake. The earthquake was detected in Kilju county in North Hamgyong Province, where North Korea’s known Punggyeri nuclear site is located, the official said. China’s earthquake administration said in a statement on its website that the quake, which occurred around 0830 GMT, was recorded a depth of zero kilometers. All of North Korea’s previous six nuclear tests registered as earthquakes of magnitude 4.3 or above. The last test on Sept 3 registered as a 6.3 magnitude quake. A secondary tremor detected after that test could have been caused by the collapse of a tunnel at the mountainous site, experts said at the time. Satellite photos of the area after the Sept 3 quake showed numerous landslides apparently caused by the massive blast, which North Korea said was an advanced hydrogen bomb. China said a magnitude 3.4 earthquake detected in North Korea on Saturday was a “suspected explosion”, raising fears the isolated state had conducted another nuclear bomb test just weeks after its last one.